Mole, a common preparation in Mexican food, has many versions, styles and meanings. In case it's not something you have heard of, it's pronounced Moh-lay. This recipe is based on what I think of when I think about mole sauce...a reddish brown chili-chocolate sauce that has a slight spiciness and a touch of smokiness and is usually prepared with chicken. To make this a fast weeknight recipe, you can make the sauce a prior night. Also, using chicken you have pre-made and shredded speeds this up. Saute bacon in a saucepan over medium high heat until fat is rendered and bacon is crispy. Remove bacon, discard or save for another purpose. Add onion, carrot and celery and saute until softened, about 5-10 minutes. Meanwhile, puree chilies, garlic and water in a food processor. Strain through fine mesh strainer. Add tomatoes, broth and strained chili puree to vegetable mixture. Simmer on high heat for 20-30 minutes until well incorporated and sauce has reduced and thickened. Strain, pressing on solids. Stir in chocolate until melted. Salt and pepper to taste, keep sauce warm. Mix chicken, sour cream, green onions and half of the cheese in a bowl. Salt and pepper to taste. Lay out tortillas, fill with chicken mixture. Roll tightly and lay in a baking dish that has a thin layer of mole sauce already spread on the bottom (to prevent sticking and burning). Bake at 325 for 30 minutes, or until golden brown and bubbling. Let stand a few minutes before serving. 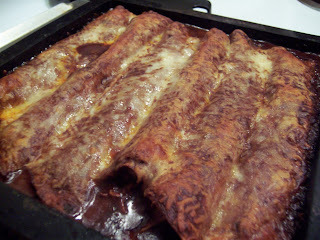 Mole sauce and enchiladas... very interesting combination. I bet they taste as great as they look! This recipe is so easy I love it. It's especially easy when you buy the pre made cocoa chile mole from Target!